Stalls marked with a vertical sign with the blue and white international symbol of access are there for the use of persons with disabilities. Certain properties are required to have parking places for persons with disabilities. Those with the proper disabled parking permits and placards are permitted to park for free for unlimited periods of time in parking zones, including those with parking meters. The following are laws for parking for persons with disabilities in Washington. RCW 46.61.581: Parking spaces for persons with disabilities—Indication, access—Failure, penalty. 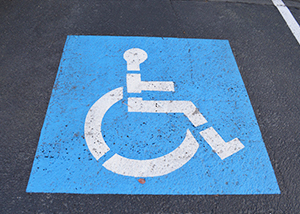 A parking space or stall for a person with a disability shall be indicated by a vertical sign with the international symbol of access, whose colors are white on a blue background, described under RCW 70.92.120. The sign may include additional language such as, but not limited to, an indication of the amount of the monetary penalty defined in RCW 46.19.050 for parking in the space without a valid permit. Failure of the person owning or controlling the property where required parking spaces are located to erect and maintain the sign is a class 2 civil infraction under chapter 7.80 RCW for each parking space that should be so designated. The person owning or controlling the property where the required parking spaces are located shall ensure that the parking spaces are not blocked or made inaccessible, and failure to do so is a class 2 civil infraction. RCW 46.61.582: Free parking for persons with disabilities—Exceptions. (1) Any person who meets the criteria for special parking privileges under RCW 46.19.010 must be allowed free of charge to park a vehicle being used to transport the holder of such special parking privileges for unlimited periods of time in parking zones or areas, including zones or areas with parking meters that are otherwise restricted as to the length of time parking is permitted, except zones in which parking is limited pursuant to RCW 46.19.050(5). The person must obtain and display a parking placard or special license plate under RCW 46.19.010 and46.19.030 to be eligible for the privileges under this section. (2) This section does not apply to those zones or areas in which the stopping, parking, or standing of all vehicles is prohibited or that are reserved for special types of vehicles.